It was a beautiful, balmy day today around the Miller Range camp area. It’s amazing how the lack of winds makes such a big difference to our comfort levels out in the field. Once we heard that our resupply flight had been cancelled for the day, we took off on a systematic search (our first since the snow fall a few days ago). Despite about 50% snow coverage of the ice field, we ended up collecting 48 meteorites today – our daily best so far! Back at camp, we treated ourselves to a much deserved Mexican happy hour – salsa, guacamole, and taco chips (thanks to the JSC folks for the chips!). 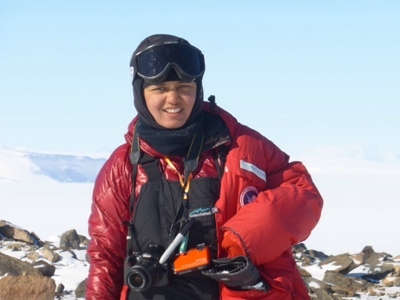 It was the very first day since I got to the Miller Range that we have been able to hang out in the open with minimum layers on.Greetings ANSMET-blog fans! Not every day has been as comfortable out here. I’m a newbie with ANSMET and I’ll say outright that it’s tough out in the field in Antarctica. However, I’ll also add that it’s the kind of tough that you want to subject yourself to again and again if you believe in the project and are in love with the idea of exploration. I’ll come back again in a heartbeat. So, the toughest day was when the air temperature was -11 F (-23 C) with 15-18 knot winds and we were out hunting for meteorites. On a day like this I have a million layers on. On my head I have on a wool skull cap, fleece woolen cap that covers my ears, a windproof balaclava, and a thick wool neck gaiter. I wear snow goggles. No part of my face is exposed to the elements. Then I have on expedition weight merino wool thermal underwear with a thick fleece layer, a 800 ct down jacket. On my legs, it’s pretty much the same: thermals, fleece, and down pants, but I add a wind proof layer as well. On top of all this, I wear the USAP issued Extreme Cold Weather (ECW) overalls that are windproof and Big Red (Goose Down Red Parka). I’ve worn Big Red everyday except today when I had to peel off layers. A pair of wool liner socks and thick wool socks work great on my feet. In fact, I’m a little too warm in them. The bunny boots keep me plenty warm. On my hands I wear a pair of polypropylene liner gloves and down mittens. To my pleasant surprise, I’ve been fairly warm even on the worst weather day. My fingers get cold sometimes but that can usually be correlated to having my hands out of the gloves for a long time (while collecting meteorites) or not having had enough to eat. Eating high fat food has been my number one method to stay warm. In the immortal words of my awesome tent-mate, Jani (a 3 time ANSMET vet), “if it’s not fried in butter or bacon grease, it’s a waste of my calorie intake”. We add chunks of butter to everything we cook in our tent. We cook bacon in the morning and then fry our lunch in the grease. It’s my dream diet! We need to consume at least 3000-4000 calories a day to stay warm and survive out here. Breathing the cold and dry air burns up the most calories. As soon as I get cold in the field, I eat a meat stick or a bar of chocolate and I can feel the blood rushing to my extremities. It works like a charm every single time! Another reason for getting cold in the field is dehydration. I try to keep myself hydrated as much as possible. Warm Tang or Raro works very well when we are out on the ice. Water is a precious commodity out here. We chip ice (which is hard work) and melt it to either drink or cook with on a daily basis. Everyone here has their own way to cope with the cold – this is how I do it. Once you conquer the cold and are comfortable, everything else is so much easier. Hope everyone is well out there! More in the next blog post.